Thanks to a combination of booming tech, smart civic leadership and craft beer, this old-school industrial city in upstate New York is thriving. 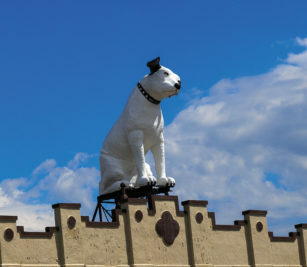 A massive but friendly looking white dog, head cocked to the side, looms over a neighborhood of blocky warehouses and industrial sites near the Hudson River in Albany, N.Y. His name is Nipper. He’s 28 feet tall, weighs around four tons and has steel and fiberglass for bones and sinew. A symbol of former electronics giant RCA, Nipper has stood guard over 991 Broadway since 1958. The building, constructed in 1900 for American Gas Meter, had fallen into disrepair when an RCA appliance distribution company called RTA Distributors purchased it and turned it into a warehouse. Over the years, the building again fell on hard times as RCA and many of the neighborhood’s other warehouse jobs started to disappear, as they have in other former industrial cities. Then in 2016, the area got a new lease on life: A local developer purchased 991 Broadway and another nearby warehouse with plans for a $70 million conversion to create 150 high-end apartments, a grocery store and additional restaurant and retail space. As Albany’s economy enjoys the benefits of a boom-years phase in-the-making, the transformation of old warehouse and industrial space is being repeated across New York’s state capital. The city, and its surrounding Capital District, are thriving thanks to the potent combination of a diversified economic base, enormous educational resources and smart zoning and governance decisions by civic leaders. “We’ve seen real growth in healthcare, tech and manufacturing,” says mayor Kathy Sheehan. “And we’ve changed the zoning to reflect what we want in our neighborhoods: mixed-use retail, residential, office, live-work-play spaces.” The combination of smart public policy and private sector support has resulted in a tremendous amount of investment—$200 million in the downtown area alone in the past three years, according to Capitalize Albany, the city’s economic development corporation. In New York State, where New York, the city downriver, draws the bulk of attention, Albany’s numbers may seem paltry. And certainly Albany suffers from a poor reputation as the seat of a state government more often than not associated with corruption and ineptitude. Plus, it has punishing winters. But in a national context, Albany is a powerhouse. Transpose its economy and population to almost any other state, and it would be regarded as a major economic hub. What’s more, Albany’s resurgence is still in its early days. The city has one of the nation’s most dynamic tech and high-tech manufacturing sectors, centered around semiconductors, medical devices, the chemical industry and video games. Semiconductor companies, including Applied Materials, IBM, GlobalFoundries and Tokyo Electron, have a strong presence in Albany and its suburbs. Collectively, the semiconductor industry spends $560 million a year on R&D activity channeled through the region’s 24 colleges and universities, particularly SUNY Polytechnic Institute, which has an entire nanoscience center, and Rensselaer Polytechnic Institute in Troy, just across the Hudson. The city has one of the nation’s most dynamic tech and high-tech manufacturing sectors. 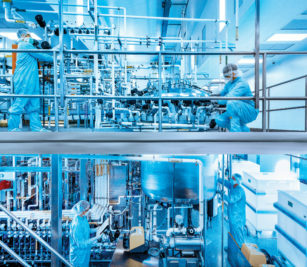 These companies, along with GE Global Research in nearby Schenectady county and biomedical giants AngioDynamics and Regeneron, are able to hire highly educated, highly skilled employees in the Capital Region. According to data from the 2017 American Community Survey, 37 percent of Albany residents 25 and older hold a bachelor’s degree or better, a rate 7 percent above the national average. Turning Albany into a city capable of attracting these sorts of companies, investment dollars and knowledge workers was a decade-long project that is still bearing fruit. 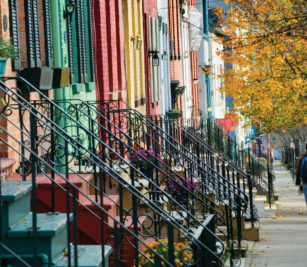 “City leaders started to see the potential that technology-changers were bringing to various regions and how the region needed to adapt to support that growth,” says Sarah Reginelli, president of Capitalize Albany. The city took a comprehensive look at zoning and created a strategic plan in 2013, the first since Albany was settled by the Dutch in 1614. A key finding was that Albany’s downtown, filled with worn-out office spaces, emptied hastily at 5 p.m., when government workers clocked out. On weekends, downtown was a ghost town. “There was a strategic move to convert space to residential instead of continuing with lower rents for class C office space,” Reginelli says. The city paid special attention to the warehouse district, with its easily redeveloped spaces. “We knew the rezoning would take two years, and we didn’t want to wait,” says Mayor Sheehan. So the city designated the district as a special “overlay” zone, jump-starting its redevelopment. And because of the strategic nature of the zoning, as well as a deliberate simplification of permitting rules, the city went from 100 cases in front of its zoning board each year before 2013 to just five in 2017. “We’re really trying, when you come into this city, to be helpful and clear about what you can do to ensure that you’re not caught up in delays or issues that prevent you from accomplishing your business goals,” Sheehan says. The city also developed walking paths between downtown and the Hudson as well as public park space, outdoor venues and running and boating opportunities. As the investment and development climate in the city has improved, business has started to pick up on some of Albany’s other attributes. Albany is within four hours by train or car of several major cities, including New York, Boston and Montreal. And the capital city also boasts the shortest average commute times of any city in New York, according to real estate research firm HomeArea.com. “I moved here from Los Angeles 10 years ago, and it was a pretty big culture shock for me,” says Jen Oneal, studio head of videogame developer Vicarious Visions, the company behind hugely popular versions of Guitar Hero, Skylanders, Destiny and Crash Bandikoot. “In terms of access to restaurants and things that you’re used to in a bigger city, I was like, ‘Wow, this is going to be an adjustment.’ But in the past five years, there’s been an explosion of interest particularly in downtown Albany and downtown Troy,” just across the river. Both cities now brim with restaurants, bars, coffee shops and new venues for live entertainment. The new Albany is on full display along Lark Street, a pleasantly walkable area near the warehouse district filled with restaurants and bars. Craft breweries have popped up throughout the city, and local Nine Pin Cider has become a staple throughout the Northeast. Tanpopo, a ramen-and-sake joint in an old train car, is almost painfully hip and regularly boasts a line out the door. Across the street from Nine Pin’s tasting room, Lost & Found, a gastropub built in an old bank, fills its patio on a summer afternoon with families, who give way to young professionals after the sun goes down. On a weekend morning, pre-brunch rush, there’s outdoor yoga in a centrally located, grassy lot. And not far away, Nipper, the watchful guard dog, looks on at a neighborhood come back to life.